As usual I am lagging behind, both with my sewing and with everything else. Such is the story of my life! All winter I have been longing to do something with the vintage cottons in my stash, but now that spring has officially arrived I am still very much immersed in sewing with dark and fluffy solids. 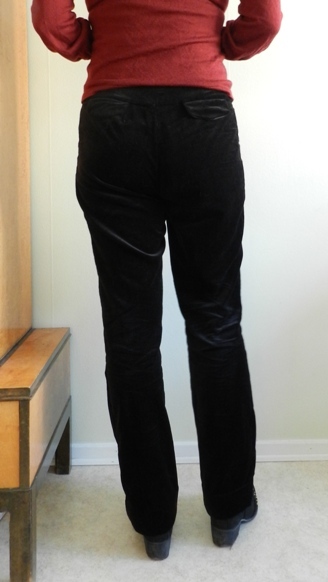 Nothing says spring like a pair of black velvet pants. 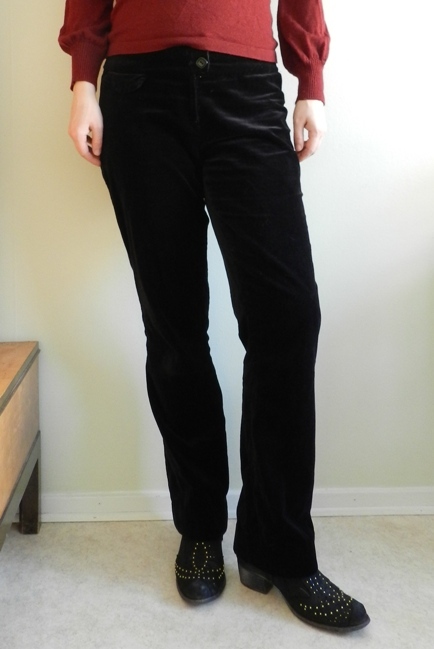 Black velvet(een) pants have been a staple in my wardrobe ever since my early teens. Throughout the years I have had them in all shapes and fabric variations, from leggings in synthetic crushed velour to wide-legged pants in thick cotton velvet. 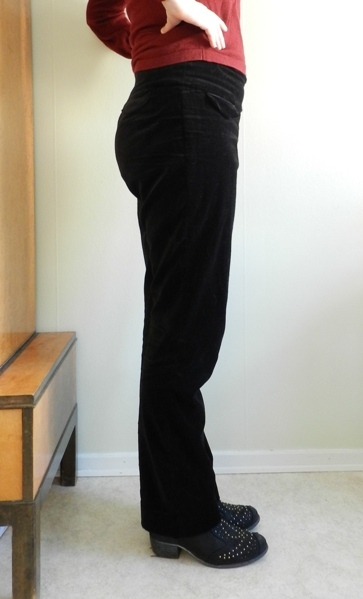 In fact, the second-to-last pair of pants I made for myself, which was over a decade ago, were in some kind of poly/cotton velvet – black of course. These pictures were taken two days after I had worn the pants for a full day. Pants testing included a visit to the playground and a nap on the sofa. 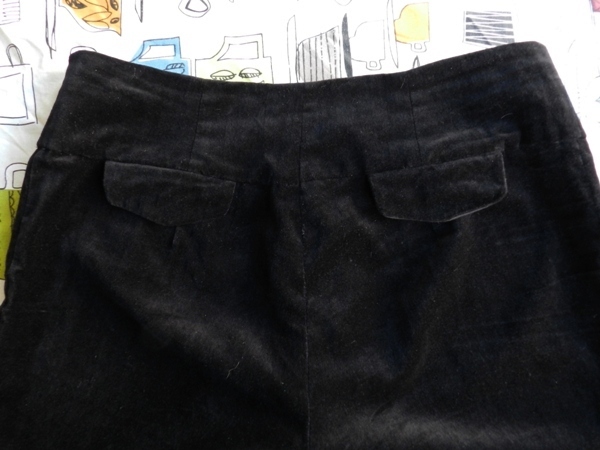 Nowadays I am trying to make most of my clothes myself, so sooner or later the time had come to replace a pair of worn-out black velvet pants. 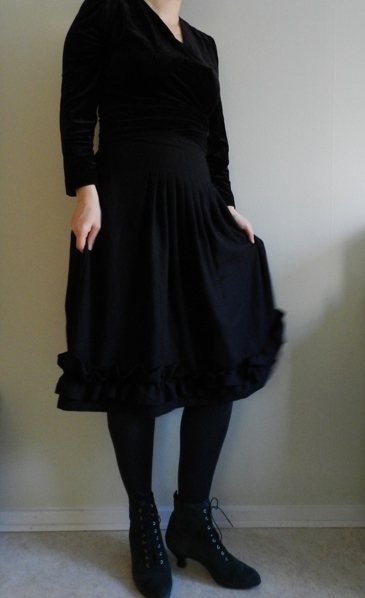 The fabric I used is a cotton velveteen from tyg.se. It was on sale for 60 sek per meter about a year ago, which seems like a modest price for such a nice fabric. As it is non-stretch, mid-weight and quite drapey I looked for a pattern for semi-fitted pants. Pattern #5 from Burda Easy Autumn/Winter 2006. I made a mix of view B, E and F.
Burda Easy Autumn/Winter 2006 contains many classic styles. Perhaps I’ll make a matching vest of the leftover fabric. Because of the long gap in pants making I decided to keep it simple and chose no. 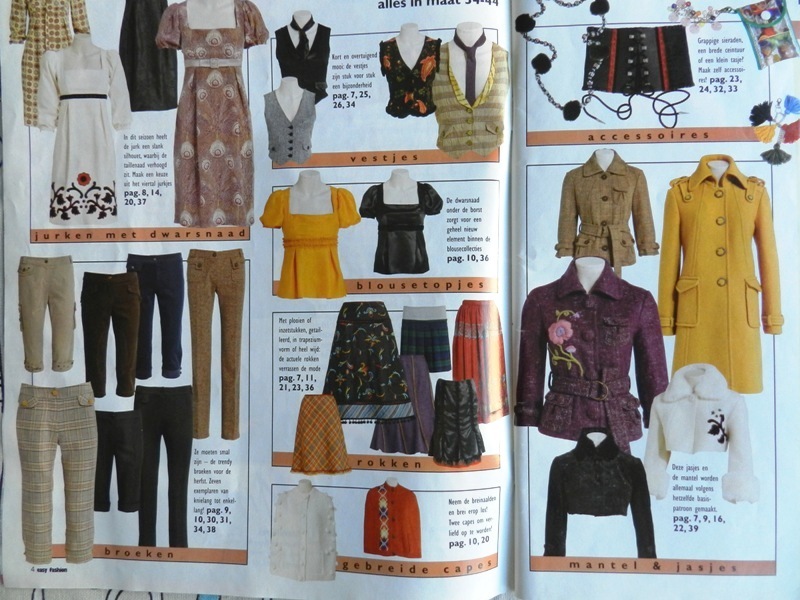 5 from the Autumn/Winter edition of Burda Easy 2006. These are basic straight-legged trousers that come in seven different views. 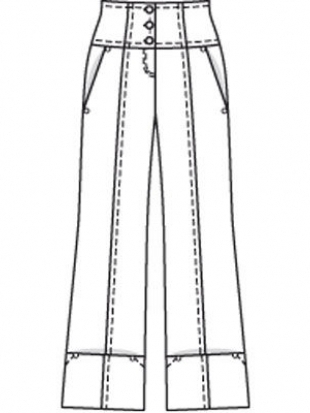 The legs and waistband are the same for all views, but the style of the sew-on pockets and lenght of the legs vary. 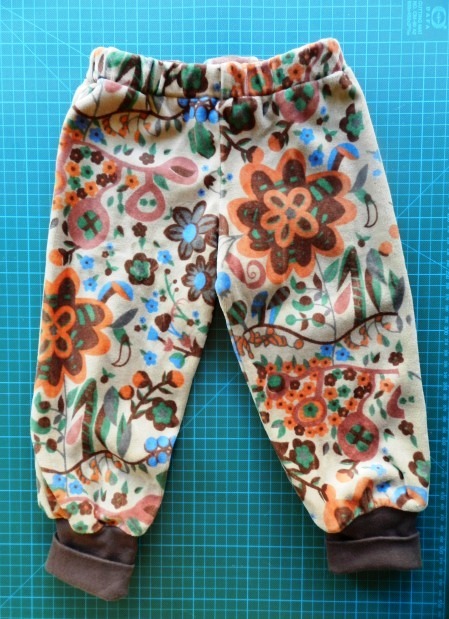 View 5E appears to be the same pattern as the Ellen pants, which is still available for download on Burdastyle’s website. The waistband is based on Burdastyle 08/2009 #106. I did not make a muslin, but cut a size 40 with ample seam allowances. After sewing the leg and crotch seams it was obvious that the waistband was far too narrow for my taste. The pants were barely covering my behind and gaping in the back. 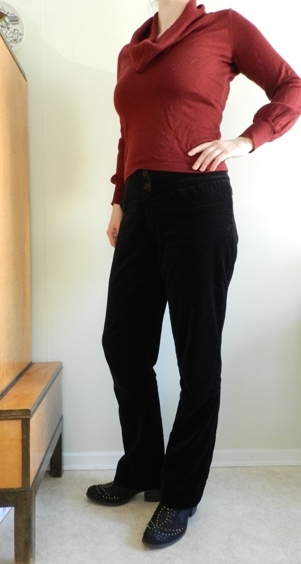 My search for a broader waistband led me to Burdastyle 08/2009 #106, a pair of high-waisted pants that I have been fascinated by ever since buying the magazine. The waistband consists of eight segments, allowing for a snug and flatterig fit. I shortened it slightly, so it would more or less fall at my natural waist. Burdastyle 08/2009 #106 (illustration: burdastyle.ru). In the end the crotch and legs are a regular size 40, although I graded out the side-seams towards the waist. The waistband started out as a size 42. It lined up perfectly in the front, but was too wide in the back. 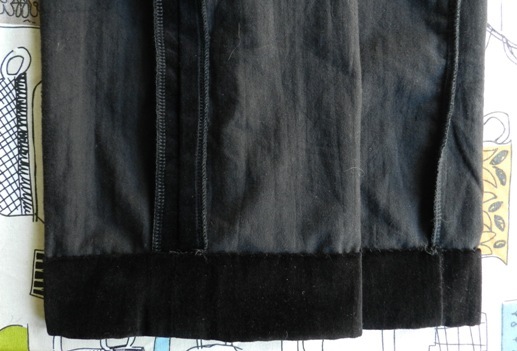 This problem was easily solved thanks to the center back seam, which I closed after attaching the waistband. Choosing a Burda Easy pattern meant illustrated instructions, which I thought would come in handy when sewing a fly-front zipper for the first time in ten years. My zipper insertion is not perfect, but fortunately, the fabric is quite forgiving (more so in real life than in these photographs that have been made lighter to show some details). My biggest regret is not interfacing the pocket flaps. I really don’t understand how I could have missed this, I usually interface everything! Because I wanted as little stitching showing on the outside, I hand-sewed the waistband facing on the inside and blind-hemmed the legs. Overall, I think that the fit of these pants is quite decent. I am particularly happy with the crotch curve, which I find hard to adjust myself. The legs, which I thought would be slim-fitting, turned out rather baggy. I don’t mind too much, though, as these pants are super comfortable and I’m sure I will get a lot of wear out of them. To be honest, my favorite feature is the waistband, which means that I should probably get ready to sew Burdastyle08/2009 #106! 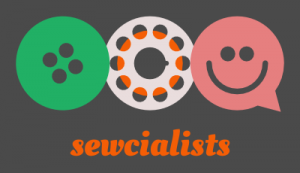 The internet is full of helpful tips on sewing with fabrics with a pile. After piecing the information together and experimenting with the settings on my machine I opted for a combination of a thin needle, low pressure and a long stitch length. As I don’t have a walking foot I used a non-stick foot. Most seams were sewn in the direction of the nap, so I sewed the legs from bottom to top and did not experience any shifting. Hurrah! 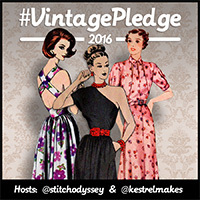 I have been sewing quite a lot with fabrics with a pile lately. I am currently in the middle of finishing a vintage velour dress, so stay tuned for more fluffy fabrics! Wow! Velvet pants 🙂 Never owned a pair but they sound sumptuous! Thank you, Siri, I hope all is well with you! For some reason, I can’t get very excited about sewing trousers, but at the same time they’re a rewarding project (I have hardly taken them off since finishing them). I ran across your blog while looking for a pant pattern that isn’t huge on my legs. From your pics, it appears we have similar builds, except maybe you are taller -I am 5’8″ with most of my height coming from my legs; my inseam is 34″ to the floor in bare feet. Typically I have to take 2-3″ of width from the thigh inseam to remove most of the baggy folds at the back thigh. I’d love to find a better fitting pattern. Can you tell me more of the fit you experienced? I would be very grateful! Hi Sheralyn, thank you for your comment, I am 175cm, so about the same height as you. I know what you mean by baggy (back) legs. In my limited experience, I end up with baggy legs when I pick a size based on my waist measurements (which with Burdastyle would be a 42). I am a larger size on top (including waist) than on the bottom (hips and legs) and find I get a better fit when choosing a size based on my hip measurement and then grading out the side-seams above the hip. 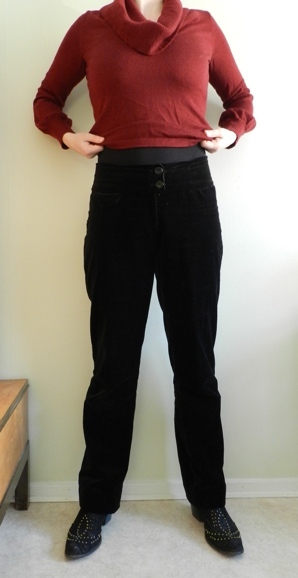 In addition, I recently learnt in the sewing circle I attend that the distance from my hip to waist is a bit longer than average (normal for a relatively tall person, I guess), so the waistbands of shop-bought pants and unaltered pants patterns often hit me too low and end up being unpleasantly tight. Anyways, I would say that the velvet pants have a very regular fit, not too tight and not too baggy, but beware of the low rise! The legs are straight, so easy to lengthen/alter. I love wearing them and with the broader waistband they stay up well, also after a couple of wears. I hope this is helpful to you!